International carbon markets have promised to catalyze low-carbon investment in regions of the world that are in need of both sustainable growth and a stable climate system. 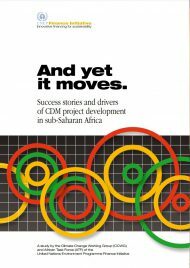 The expectations for CDM project development in sub-Saharan Africa were therefore particularly high; the results to date rather disappointing. Through real-world case studies in a number of countries and across different types of low-carbon technologies, this study shows that, despite many barriers and difficult circumstances, it is possible to combine financial with environmental returns in a region that is in need of both.